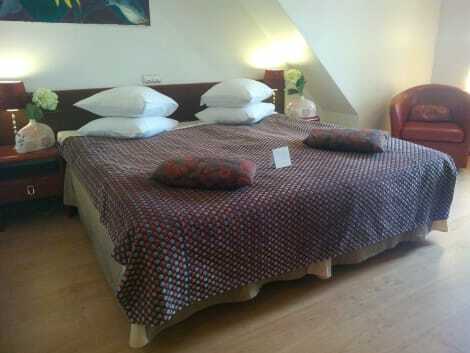 The elegant Hotel Justus is located in Riga's Old Town, next to the famous Dome Cathedral. The historic and stylish rooms are equipped with air conditioning, flat screen TV, minibar, safe and complimentary toiletries. Guests will enjoy the hotel's sauna (15,- Euro up to 3 hours) free Wi-Fi and a excellent breakfast. 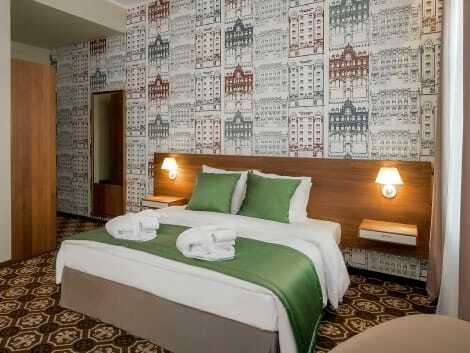 The 4-star Bellevue Park Hotel is found by Riga’s Victory Park, and is within walking distance of the Old Town. The hotel also have a breakfast restaurant, a bar, a spa and salon and complimentary fitness facilities. 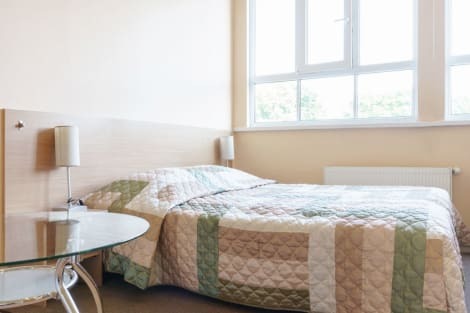 Rooms are air conditioned and have minibars, flat-screen TVs with cable channels, tea and coffee facilities, private bathroom and you can borrow an iron from the hotel’s 24-hour front desk. Rising above the city, the modern 4-star Radisson Blu Latvija Conference & Spa Hotel is just a short walk from the Flower Market and Freedom Monument. Enjoy a drink while taking in the city from the 26th floor Skyline Bar, treat yourself to local and international cuisines in Restaurant Esplanade, expert food and wine pairings in D’vine, a flutter in the casino or relaxing session in ESPA Riga Spa. Rooms are air conditioned and offer minibars, bathrooms with complimentary toiletries and high-speed wi-fi. Surrounded by Riga’s famous Art Nouveau architecture, the 4-star Hestia Hotel Jugend is within walking distance of both the Old Town and the beach. Combining classic style with contemporary comfort, during your stay you can unwind in the SPA Center, which offers a range of relaxing treatments and has a sauna, and enjoy an international selection of cuisines in the KUKBUK restaurant. Rooms overlook the hotel’s courtyard and offer minibars and free wi-fi access. 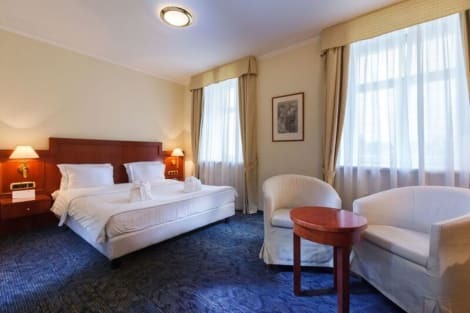 4 star Business Hotel Radisson Blu Daugava hotel is nestled beside the Daugava River, offering breathtaking views of city's beautiful old town, overlooking the Daugava River. The Panorama Restaurant serves an international menu, accompanied by inspirational river views, and you can unwind in the hotel’s fitness centre, 24-metre indoor pool and sauna or treat yourself to a session in the SPA Salon Aleksandra. Rooms offer free high-speed wi-fi, tea and coffee facilities, minibars and a complimentary breakfast buffet each morning. Make use of convenient amenities, which include gift shops/newsstands and a reception hall. Pamper yourself with a visit to the spa, which offers massages, body treatments, and facials. If you're looking for recreational opportunities, you'll find an indoor pool and a spa tub. Additional features at this hotel include complimentary wireless Internet access and concierge services. Guests can catch a ride to nearby destinations on the area shuttle (surcharge). With a stay at Saulite in Riga (Centrs), you'll be within a 10-minute walk of Riga Central Market and Berg's Bazaar. With a stay at Saulite in Riga (Centrs), you'll be within a 10-minute walk of Riga Central Market and Berg's Bazaar. This hotel is 16 mi (25.7 km) from Jurmala Beach and 0.4 mi (0.6 km) from Latvian National Opera. This hotel is 16 mi (25.7 km) from Jurmala Beach and 0.4 mi (0.6 km) from Latvian National Opera. Enjoy recreation amenities such as a sauna or take in the view from a terrace. Additional features at this hotel include complimentary wireless Internet access and a television in a common area. At Historical Ekes Konvents 1435 Hotel, enjoy a satisfying meal at the restaurant. For your convenience, a complimentary breakfast is served daily from 8:00 AM to 11:00 AM. With a stay at Best Hotel in Riga (Atgazene), you'll be within a 10-minute drive of Riga Central Market and SPICE. 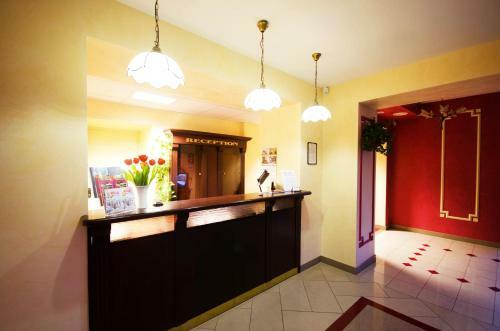 This hotel is 14.1 mi (22.7 km) from Jurmala Beach and 2.3 mi (3.8 km) from Golden Bowling Center. Latvia's capital and also its largest city, Riga is home to over 640,000 inhabitants. The city lies on the Gulf of Riga and is host to some highly impressive architecture. Founded in 1201, the city was listed as the European Capital of Culture 2014 and hosted both the 2006 NATO Summit and the 2003 Eurovision Song Contest, so it goes without saying that the largest city of the Baltic States can hold its own. There's an abundance of cultural heritage to absorb in Riga. If you love museums, start with the Museum of Occupation of Latvia. Guided tours will take you through the prison cells and exhibitions about the history of KGB activity during Soviet occupation, where thousands of Latvians were oppressed and murdered under this brutal regime. Try the Latvian Ethnographic Open-Air Museum, where an open-air depiction of ancient Latvian farmers and fishermen welcomes you. Lastly, visit the oldest museum in Riga, the Museum of the History of Riga and Navigation, which is housed in a 13th to 20th-century architectural monument – the Riga Dome Complex. Love quirky antiques? Visit the one-of-its-kind Riga Motor Museum. Dedicated to the restoration, exploration and collecting of antique vehicles, it really is a unique place. And if it's eccentricity you seek, take a trip to the Film Museum, a miniature film theatre room used for film screenings, solely for the depiction of arts. Visit the Freedom Monument, a memorial honouring soldiers killed in the War of Independence. St Peter's Church is one of the oldest monuments of medieval architecture, and is a UNESCO World Heritage site. Located in the picturesque historical centre of Riga, you can view the capital from the top of the church. Covering 12 acres in the city centre, Vermanes Gardens is Riga's oldest public park. With plush greenery and art nouveau architecture it makes for a spectacular trek. If you're visiting with family, make the kids' day with a visit to Riga Zoo, home to over 4,000 animals and owner of National Zoo status. The origins of the zoo can also be traced to earlier centuries. There are no shortages of bars and clubs in Riga, so expect to let your hair down. The best reviews belong to Bar.Ber.Room, situated in Old Riga, and Skyline Bar, which is located on the staggering 26th floor of Radisson Bhe Hotel. You'll enjoy a breath-taking view here, morning or night. Riga houses some incredible restaurants that all come with rave reviews. International SV serves Latvian and international cuisine, whilst for a fusion of Euro-Asian, try Aqua Luna, the restaurant by the riverbank. Latvian restaurants will deliver fantastically fresh food, as Latvian cuisine is based on the herbs and ingredients that are in season. Riga hotels vary and offer anything from art nouveau settings to spa hotels for a relaxing break. Like the city, it offers something for everyone.